Cucusoft DVD to Apple TV Converter is an easy to use DVD to Apple TV converter software program for Windows.This DVD to video and audio ripper can convert almost any type of DVD to play on Microsoft Apple TV Video player, and DVD ripping is done at a very fast conversion speed. With this great DVD to Apple TV Ripper it is also possible to watch the output in full screen mode while converting your video files. • Rips almost any DVD to the Apple TV video file format. • Supports Subtitle Selection & Audio Track Selection. • Video crop modes : 16:9, 4:3, full screen and so on. • Video resize modes : "Keep aspect ratio", "Stretch to fix screen" and more. • Split output video by DVD chapters and titles. Also full support for MTV DVD and Episodic DVD. • Customize your output video file size / video quality. • Easily customize the video properties of your DVD ripped video file through the output profiles. 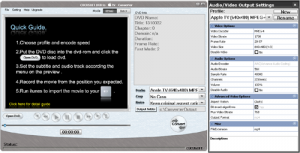 • Convert DVD to MP3 audio ; even ripping Dolby Surround & DTS Surround audio track is possible.